Very interesting. It completely gets rid of the horrible geometry and requirement to yield that cause the danger here, rather than just trying to reduce the negative impact of an inherently pedestrian hostile layout. Ratner could be convinced to part with part of that lot I’d bet. The open question is traffic impact. Are you suggesting that this would be continuous flow? That’s never going to happen here, nor should it. You’d never be able to cross the outer arms on foot. I’m not sold on traffic circles for bicyclists. I’ve not studied the concept; but I know that the two circles on corners of Prospect Park (Bartel-Pritchard Square at Prospect Park West and Prospect Park Southwest; Park Circle at Prospect Park Southwest and Parkside Avenue) are hard to navigate on a bike. Also, the circle where Kings Highway meets Avenue M is pretty unpleasant. Having ridden a bit in Washington this year, I can also report that the many circles there are places to avoid. In those locations where the diagonal state-name streets make complex intersections with the north-south-running numbered streets and the east-west-running lettered streets, I would rather deal with the order imposed by streetlights than with the constant flow of the circles. So I think that the best solution to a multi-street intersection is the use of traffic signals to apportion time to each street for straight-ahead movement and then for turning. Park Circle has a protected bike lane that’s fairly comfortable, though people cycling completely get the shaft on the signal phases. Like I said to Vooch, I don’t think anyone is suggesting that this would be continuous flow. Signals would be dictating which arm enters the circle and when. I don’t actually mind bartel pritchard. I just use the general traffic lane. That circle has a small enough diameter that speeds are pretty low and I find it easy to just merge. Others take the partial bike line around it. Park Circle is a bit of a mess. The bike lane helps…. But the design seems to be based around interfering with motor vehicle movements as little as possible, to the detriment of the bike lane and people on foot. Kings and M looks like an absolute nightmare. But following the signals, its never really felt uncomfortable to me. But I’ve only ever been there on the weekend. But it could use some actual pedestrian islands where those plastic bollards direct traffic. I’m guessing those are a recent improvement. Signals kind of defeat the point of having a traffic circle in the first place. Properly done, traffic circles work just fine for cyclists and pedestrians. You generally are required to yield to pedestrians at the crosswalk before entering the traffic circle. No reason we can’t have cameras to enforce this. If we tried to signalize it, we would have complex phasing and very long light cycles. As a result, pedestrians and cyclists would ignore red lights, defeating the purpose of having the traffic signal in the first place. It’s funny that I suggested this last night and it turns out they’re actually seriously considering the idea. It’s about time. NYC’s many complex intersections like this are tailor made for traffic circles. Note there is a difference between traffic circles and roundabouts. Roundabouts are more appropriate for NYC, and much safer for cyclists/pedestrians than traffic circles. A roundabout may be a poor fit for the intersection here, mostly due to the high volumes of the 2 main roads (Atlantic/Flatbush). the max daily volume for a 4 leg roundabout is about 50k cars/day. Adding a 5th leg gets you to a 62.5k car capacity. Flatbush has roughly 40-50k daily. For a total of about 100k cars. Double those numbers for a two-lane roundabout. Note that throughput isn’t exactly high with the complex phasing needed when you have 5 or 6 leg intersections. Whenever I hit those on a bike, I end up going through the red light, thinking the traffic signal is probably broken, because the light cycle seems so ridiculously long. I often see cars do the same if traffic is light. then The Traffic Circle Is a Perfect Solution for this intersection. A roundabout is more appropriate here than a traffic circle (the latter are typically used solely for visual appeal rather than better functionality). which calms Motor Traffic more ? The roundabout due to the smaller circle diameter. Here is a link for real-life examples of good roundabout design. That’s a reason we can’t. We can’t even get turning drivers yield to peds crossing with a walk signal. We’re probably a couple decades of a complete cultural shift away from getting drivers to yield to the thousands of peds crossing Atlantic and Flatbush every day. Jersey City Bike Share: can’t speak to the main topic of the article but the Danforth Avenue station complaints are ludicrous. It’s not that dense an area and the light rail stop actually abuts a cemetery, along which street parking is legal. Also, what does it take, like two parking spaces tops? These are people who are complaining about walking half a block. 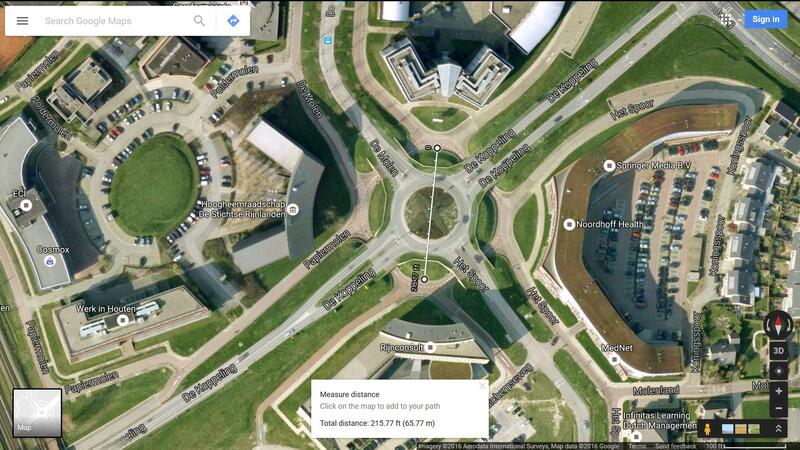 Oh, just go ahead and build a Magic Roundabout like they have in Swindon (UK). I’m sure that will solve all the problems. Double those numbers for a two-lane roundabout. He gave the numbers for a two lane roundabout. Can you find any example of a roundabout in the world that deals with the motor vehicle and pedestrian volumes present at that intersection? Here is the next chapter of the document reasonableexplanation linked to. Note how pedestrian volumes (assuming pedestrian priority) lower roundabout capacity significantly. Usually designs are based on how heavily something gets used during the day, not the middle of the night when few are on the road. While sensors can get around that, they wouldn’t be useful much of the day. The exception to this is the complex networks that make up midtown in motion and the similar project in Flusing (not sure how far that has progressed). Probably worth the incremental cost elsewhere as signals are replaced, but the added value is likely not worth the expense of speeding up the life cycle. It’s relatively easy and practically cost-free to have signals go to flashing yellow on arterials and flashing red on cross streets late nights if the money isn’t there for sensors. Most other places have done this for years, even decades. Doesn’t work for pedestrians if there aren’t beg buttons that are working. A lot of the existing ones are hooked up to nothing. And plenty of the time none exist. Flashing yellow will be taken as license to speed. Not safe to cross at that point. Try to wire in beg buttons and the frail old wires in the control box for the light break. Go to replace that and the power cables need to be replaced too. All of a sudden you’ve got a big expensive project on your hand. Didn’t you say replacing the water main on your block might mean the connection to your house would fall apart and need to be replaced? Old stuff can’t always be upgraded, even slightly, without it turning into a huge mess. Hardly a cost free change. Actually the water main replacement went off without a hitch. They connected to my existing line right in the street where it intersected the water main. I think there were some issues elsewhere in the neighborhood where the builders had used cast iron lines going to the houses and those needed to be replaced with copper to meet code. I’m not sure you need beg buttons late nights. There are enough gaps in traffic to easily cross. I do it all the time crossing against the light. You could keep the lights working normally at any intersections which have much pedestrian traffic late nights, which by me is just about none of them. What I don’t understand is one-horse small towns install sensors at traffic signals as a matter of course, so it’s not like this is a big ticket item. NYC could have done this. In large swaths of the outer boroughs phased traffic signals are really only needed for a few hours of the day during peak times. That leaves 15 or 18 or 20 hours where sensors might actually make more sense. Even in Manhattan sensors are useful for perhaps 8 hours of the day. We’re hardly talking about conditions which only exist at 3 AM or 4 AM. >I’m not sure you need beg buttons late nights. There are enough gaps in traffic to easily cross. For you, alright. For everyone who can currently cross with a signal? >Speeding occurs anyway whether traffic lights are on or not. In fact, trying to make the light is a big reason people speed. Empty road, cross traffic is supposed to yield, you’ve just said pedestrians can wait for gaps so they’ll be yielding too, that means people will gun it. This is the sort of setup to encourage people racing 100 mph on surface streets. Yielding to peds at night really isn’t practical because a driver often can’t see a pedestrian in time to stop for them, even if they’re only going 25 mph. Also, off-peak hours motor vehicles are easily the majority user. So put the traffic signals on flashing yellow, and anyone crossing needs to wait for a gap in traffic, which typically occurs very often. With signals pedestrians have to wait anyway in theory, often even if it’s safe to cross, so most ignore the light, defeating the purpose of having it in the first place. Overall yielding to cross traffic late nights minimizes your wait time. If need be put more pedestrian refuges on wide streets so you don’t have to wait for the entire street to be clear before starting to cross. Those would be of great value during the day as well for people who can’t cross in one light cycle. No reason we have to have traffic lights cycling off-peak times. Nearly everywhere else either has them defaulting to flashing yellow or going on sensors. NYC isn’t special. If we want to do things which might reduce traffic during the day, like encourage more deliveries late nights, then minimizing delays by getting the lights off cycles is a great way to start. Late night bus service would be speeded up, also. This is the sort of setup to encourage people racing 100 mph on surface streets. That’s why you either have police or speed cameras. Then there should be a traffic light. Just because you like playing frogger doesn’t mean everyone should have to if they want to cross the street. Right, a traffic light which no pedestrians will bother obeying, pretty much making it pointless. I never see pedestrians waiting at red lights at night, unless there also happens to be cross traffic. And I never see enough cross traffic such that you’ll be delayed less waiting at a red light, as opposed to just waiting for a gap in traffic. You fail to understand that when traffic controls ask you to do nonsensical things, like stop at empty intersections, they tend to be disregarded. I see lots of cars blowing red lights late nights for exactly that reason. I see bikes and pedestrians blowing red lights all times of day for the same reason. If NYC insists on using traffic lights excessively, then its residents should insist they never, ever go red at empty intersections. Not hard to do with today’s technology. Whatever it may cost is a rounding error to NYC. Also, as I mentioned before, there are few pedestrians at night. You’re making lots of people pointlessly stop for the benefit of almost nobody. If you really think pedestrians need traffic signals to cross a street instead of their own judgement, then you’re in the minority. Whatever it may cost is a rounding error to NYC. Can’t always make improvements to old tech, cost to improve old lights will sometimes be comparable to the cost of installing new ones. Total cost to upgrade all traffic lights to run on your sensors would run into the billions. Hardly the best use of limited funds. Also, as I mentioned before, there are few pedestrians at night. There are also few cars and few cyclists either going somewhere or trying to get a good workout obsessed with getting a good time on their ride. If you really think pedestrians need traffic signals to cross a street when traffic is light instead of their own judgement, then you’re in the minority. Not for everyone. But for some people, yes. Easier to just do what they’ve done in Europe and get rid of most of the traffic signals, then put those which remain on sensors. You’re grossly overestimating costs. NYC doesn’t need to upgrade 12,000+ signalized intersections with sensors. It just needs to upgrade a few hundred to at most 1000, then remove the rest which are either redundant, or not justified by traffic levels, or ended up being installed solely because community boards made a lot of noise. Going from maintaining 12,000+ signals to under 1,000 would easily offset the costs of installing sensors. It’ll also make getting around faster for all users, not just drivers. That’s exactly the point. In a nutshell, except for a few peak hours per day, traffic levels on quite a few streets in terms of numbers of all types of users are low enough that traffic signals just aren’t necessary. That’s why it makes sense to default to flashing yellow/flashing red. On many streets you could do this during the day also once you’re out of rush hour. If traffic levels on these streets were this low 24/7 the traffic signals never would have been installed in the first place. Maybe you need them during the busiest 4 or 6 or 10 hours of the day but you don’t the rest of the time. Just about every other place does this. NYC isn’t special. Anyone know the procedure to get the feds to request warrants to see if a traffic signal was justified, then require its removal it if it’s not? What part of “these traffic lights are not reliably obeyed late nights” do you not understand? Get out of your ivory tower and back into reality. The reality I see is that drivers do not stop at red lights at night reliably enough for someone blindly cross at a walk signal. I’ve nearly been hit on my bike by cars running red lights at night a number of times. It’s a good thing I look even when I have green. Being that a pedestrian really can’t safely cross a street a night without looking and yielding to cross traffic, even if they have the light, I’m just not seeing what purpose keeping the traffic signals active that time serves. Compliance is better than asking drivers to yield to pedestrians. People get into the habit of blowing lights because most of the time nothing is coming. Better to get drivers into the habit of having pedestrians yield to them? Other places have different cultures. Changing infrastructure is slow, but still faster than changing culture. If traffic signals make things safer, then how come Europe, which uses far fewer traffic signals, has a far better street safety record than the US? Do you think the number of traffic signals are the only difference between NYC and Europe? BTW, NYC has a lower per capita motor vehicle death rate than most countries in Europe. Except pedestrians during the day, who will see significant increase in delay in crossing streets. Which traffic signals near you do you think are not justified based on any MUTCD warrants? You think ‘Europe’ has gotten rid of most of their traffic signals? Great Britain has the most traffic signals of any country in Europe. Note how people are vehemently complaining about the misuse of traffic signals and suggesting some of the same things I am, like having them go to flashing amber at quieter times of the day. The kicker here is the entire country of Great Britain only has about twice as many traffic signals as NYC, and this is after a major increase, By any standards, NYC has a totally ridiculous number of traffic signals. As for signals which aren’t justified, I’d say for starters basically any signal between minor cross streets, or a major street and a lightly trafficked minor street should go. Many arterial-arterial intersections which currently have (and probably need) traffic signals for much of the day can be converted to roundabouts. Some can’t be because of lack of space. And you have some blind intersections where lines of sight are blocked by things like bridge abutments. Those are one of the few places you really need traffic signals. But overall, I’d say we could get rid of about 90% or more traffic signals. That would put us more in line with most European cities. Tell that to people walking along Manhattan avenues who have to wait a light cycle at virtually every block, depending upon light timing. You’re acting as if what we have now is so wonderful for pedestrians. It isn’t. If traffic is heavy you’re stuck waiting forever for the light the change. Then when it finally does you often can’t cross anyway on account of a conga line of turning cars. The obvious answer is to get rid of unnecessary traffic. NYC unfortunately won’t do that. A second answer is to just say screw it, let the cars have the more congested intersections but put overpasses or underpasses so pedestrians and cyclists can cross without delays or getting killed. Not an ideal solution, but it’s probably better than what we have. If access is a problem, put escalators or ramps in. Remember we’re not doing this at every single intersection, only the really bad ones. Chances are great anyone walking an average distance will only need to go over one of these. NYC has a lower per capita motor vehicle death rate than most countries in Europe. And NYC has a lower per capita motor vehicle death rate than suburban or rural America, too. It may have something to do with the fact that motor vehicle speeds here aren’t very high. Our pedestrian death rates however are abysmal compared to European cities, all of which have far fewer traffic signals. I really don’t see how you could defend the status quo in light of that. Sounds like an objective group. For instead of being used as a road safety device to stop accidents, they have increasingly been deployed by authorities to deliberately slow down traffic, create artificial jams and ‘prioritise’ buses and pedestrians. Vague answers, or specific intersections? How about on union tpke, from Main street to Springfield which signals would you keep, which would you get rid of, and what alternative crossing enhancements would you propose between the remaining traffic lights? Many arterial-arterial intersections which currently have (and probably need) traffic signals for much of the day can be converted to roundabouts. By bulldozing lots of buildings to make room for them? Some can’t be because of lack of space. Most can’t be due to lack of space. Roundabouts are massive, and the city is mostly built out. You’re acting as if what we have now is so wonderful for pedestrians. Nope, just much much better than what you’re proposing. Then when it finally does you often can’t cross anyway on account of a conga line of turning cars. The british auto club’s report you linked to criticized especially the increase in lights with barnes dance style crossings because of the impact on junction capacity. They may not be the best source for you to quote. What works in small towns and suburbs in the Netherlands doesn’t always translate to large megalopolises. Isn’t that the point you always bring up about needing a bikeaduct grid? The complaints are about needless delay being caused by adding unnecessary traffic signals. The same criticisms levied would be valid if they came from a cycling, or even a pedestrian, advocacy group. The fact they come from a motorist’s association is moot. Except in NYC the traffic signals are being used for neither. I might not complain too much about traffic signals if we used them to prioritize buses, and we had pedestrian/cyclist sensors so the light would go green before you reached an intersection (much like they do in the Netherlands on cycling routes). Instead, the traffic lights cause buses to be stopped about half the time (bad for me), force me to wait to cross streets if traffic is too heavy (bad for me), and delay me on my bike (bad for me). They also make motor vehicles stop when it’s not necessary, which adds to noise and air pollution (bad for everyone). It’s incumbent upon the state to engineer safety in the least intrusive way possible. If traffic signals are used, then they should be used mainly to give priority to vehicles with more people or people getting around under their own power. They should also never go red unless somebody is on the cross street. Railway signals work exactly like that. If the block ahead isn’t occupied you don’t get a stop aspect (the exception to this is when a dispatcher can hold a train in a station for scheduling reasons). Everything except the lights at Main, Parsons, 164th Street, Utopia Parkway, 188th Street, Francis Lewis Boulevard, Bell Boulevard, and Springfield Boulevard would be removed. Of the remaining 8 intersections, it looks like we would have room to convert all but four of them (Main Street, Parsons Boulevard, 188th Street, and Springfield Boulevard) to roundabouts (note that roundabouts fit in the space without removing buildings, traffic circles don’t). So that leaves four traffic signals on a ~4.2 mile stretch instead of more than 20. Not a 90% reduction but you’re starting off with a street which already has less than an average number of traffic signals for NYC. Lots of other streets would easily have 40 to 80 traffic signals in the same 4.2 miles. If you cut them to 4 to 8 then you achieve a 90% reduction. The busiest intersections for pedestrian traffic turn out to be exactly the ones where the lights would remain, so we’re still accommodating most of the pedestrians. I would probably put a pedestrian overpass near St Johns to accommodate the large numbers of students and also the people shopping in that area, perhaps a second overpass a little east of Utopia Parkway if it turned out the roundabout there had too much traffic to let people cross without waiting a long time. You would probably also need an overpass or two near Cunningham Park, or perhaps just have a few signalized crossings with push-to-cross buttons. Going further east than Cunningham Park, there just isn’t much pedestrian traffic on Union Turnpike until you get into the shopping area east of Little Neck Parkway. Without going into specifics for every other street, in a nutshell unless it’s an arterial-arterial intersection which can’t be converted into a roundabout, the traffic signals would go. Another strategy is to dead end minor cross streets at major arteries. At that point you no longer have cross motor traffic, so the need for a traffic signal for that reason vanishes. You might still need one for pedestrian crossing, but if you have a curbside protected bike lane the traffic signal doesn’t need to apply to bike lane. You could do like they did at PPW, have flashing yellow for bikes when motor vehicles get a red. This scheme gives pedestrians safe crossing without delaying bikes. You can enhance it further with pedestrian sensors so the motor vehicles on get red if people are crossing, and pedestrians don’t have to push beg buttons. I’m just not seeing it. For example, when I want to cross 164th Street during busy times, it seems the light is red for a long time. I’d much rather have an overpass there. Nothing more frustrating than just missing a bus on the other side because you had to wait to cross the street. The overpasses would mainly be used on arterials. With typical arterial spacing of 2 to 4 per mile, it’s highly likely anyone walking any average distance would only need to use one such overpass. If need be you can put in ramps or escalators for greater accessibility. The sole reason I propose these bikaducts is precisely because of entrenched attitudes like yours which state we can’t get rid of excessive motor traffic or traffic signals. Bikes are fundamentally incompatible with large numbers of motor vehicles or traffic signals. If we want to get a much higher bike mode share but can’t get rid of traffic signals or motor vehicles, then grade separating bike traffic is the only viable alternative. Note that bikes can replace quite a bit of what is now pedestrian traffic also, so this is a secondary benefit. Except in NYC the traffic signals are being used for neither. Let’s look at the signals you want to get rid of. Much of the north side of Union between Main and Parsons is a retail strip. You have dense (for the area) residential on the other side of the street. The lights at 147, 149, 150, and 152 offer pedestrians a chance to cross what would otherwise be a wall for much of the day. You’ll leave usable crossings 2400 feet apart. What do you think happens when people have to walk so far out of the way to get where they’re going? What do you think happens to the people who walk (and bike) down 150 because it’s much more pleasant to not travel down a busy street? Now they have to walk 1200 feet to a crossing. You’re worried about people being delayed 30 seconds for a light? East of Parsons the next light is at 159, it’s for the fire department so they can get their truck in and out of the station. I’ll assume you’d allow that one to remain as well. The light at 168 is a quarter mile east of 164. That’s decent spacing for bus stops. It’s not a limited, but there are 5 express buses that stop there in addition to the 46. Should all the people who use the stop have to use the one at 164 for one leg of the trip so they can cross the street? You have some retail at that corner, what do you think happens when you ask people going to those stores to walk a half mile roundtrip and wait for a light to get to one on the other side? How is that better than just waiting for a light? The lights at 173 and 175 would be replaced by your St Johns overpass. East of Utopia Union is a retail street. ~750 feet to the light at 179. Too close for you. Want to check out a store across the street? Quarter mile walk round trip plus wait for a light to cross Utopia. Or make it a roundabout and have a stressful time getting cars to stop for you in the crosswalk. Still a quarter mile walk. Wouldn’t it be easier to wait 30 seconds for the light to change then walk across at 179? Next light at 184 is for the Hillcrest Jewish Center. They have a school there during the week. It serves people walking around in their neighborhood. Is that so horrible? Must the street only serve those traveling through? Almost a half mile round trip to use the crossing you’d leave at 188. 193 and 199 you’d replace with an overpass to the park. Does it matter if nobody in a house fronting union wants a switchback built in what would probably have to be on their private property? Where else will it go? Get rid of parking/rush hour lanes for it? Where does your bike lane go then? You have two lights east of Francis Lewis for the Clearview expressway ramps. And another just past there for Hollis Ct/Hollis Hills terrace, a minor arterial/collector. Do they go too? These are the first lights I’ve got to that you didn’t mention keeping that are for drivers. The rest have been for pedestrians except the one for FDNY. The light at 211 is for the Hollis Hills Jewish center. They have a school during the week. Tell everyone who uses that light too bad? The light at Bell isn’t just for cars on the cross street, it also serves people getting to church, to the library, to PS 188 just off union. The next light at 220 is for the Ebenezer Mission church. Most of the lights you are getting rid of are for pedestrians. Drivers use them too. But they’re put in for pedestrians. People walking around in their own neighborhood. You want to take that away to speed through traffic. A lot of the country is like what you’re proposing. Travel sometime and see it. It really makes for a pretty miserable place to be. Look at the built environment where roundabouts get used in the Netherlands. It’s not in connected urban cores. Like it or not eastern queens is not a dutch suburb. Maybe it would be better if a main auto route wasn’t also a main retail street. A lot of those lights you’re talking about could be replaced by either pedestrian overpasses or could instead have push-to-cross buttons (or better yet pedestrian sensors). I’m not at all against having lights solely to let people cross streets, but why the F do they have to cycle to red even when nobody is crossing? The one at 184th Street especially is the best example of that. By definition there’s no vehicular cross traffic there because 184th is one way away from Union Turnpike, so the light is strictly for pedestrians to cross. Fine, but have it cycle to red only when someone is using the crossing. Same thing with all the other lights you think we should keep. Put sensors on them so they only go red when you have vehicles or pedestrians crossing. NYC upgraded its traffic signals to LED over the last decade. That would have been a great time to put in sensor loops and cameras. That may well be the case but let’s qualify things here. Most of the really miserable places to walk are also places where things are too far to walk to anyway. If you have retail one or two miles from the nearest residential area it really doesn’t make much sense to spend the money to accommodate pedestrians. That said, the distances in lots of these places are still quite bikeable, so there’s no excuse not to provide at least a wide shoulder to bike on, better yet Dutch-style protected bike lanes. Those could even handle some pedestrian traffic along with the bikes without inconveniencing cyclists too much. And there’s no excuse not to provide pedestrian accommodations at bus stops, or places where there’s pedestrian activity on both sides of the road. That one’s not a problem. If I hit it on red twice a year that’s a lot. In fact, most of the traffic signals you want to keep wouldn’t be an issue either if they only went red when needed. Does it matter if nobody in a house fronting union wants a switchback built in what would probably have to be on their private property? Where else will it go? Get rid of parking/rush hour lanes for it? Where does your bike lane go then? Yes, you get rid of parking. And in its current form there really is no room on Union Turnpike for a bike lane anyway except above it, so I didn’t even factor one into my concept. You need the capacity of two lanes in each direction given traffic levels. Even if you get rid of all parking, the curbside lane is still needed for local deliveries and bus stops. Maybe it would be better if a main auto route wasn’t also a main retail street. Yep. That’s the big problem. Most of the pedestrian-heavy areas in NYC also happen to be along major auto routes. Union Turnpike is actually a fairly narrow and old street, really not suitable for coping with the traffic levels it has. Perhaps we should just limit it to buses, local deliveries, bikes, and emergency vehicles. That lowers traffic levels enough to get rid of all the lights I mentioned and to avoid the need for pedestrian overpasses. Maybe divert the auto traffic to the GCP service road and/or the LIE service road. Local traffic could probably use 73rd Avenue like it does now. Union Turnpike seems to be mostly people coming from points further east passing through. There is one thing I’ve noticed in some cities other than New York: motorists stop to wait for pedestrians who approach (approach!) crosswalks at unsignalized intersections. It’s caught me off-guard, as a New Yorker. It doesn’t happen in every city, and it certainly doesn’t typically happen in New York. Until it does, New Yorkers need traffic signals to help them get across the street. Fine, but have it cycle to red only when someone is using the crossing. Ever get frustrated with lights that seem to be poorly coordinated with each other? That can get a lot worse when the lights are setup to be responsive to beg buttons. The workaround is to not let the beg button override the cycle designed to facilitate through traffic, coordinated with the nearest arterial intersections. A lot of beg buttons in other cities are setup like that. It’s a huge pain, much worse for about 12 hours a day when most travel takes place – that includes pedestrian travel – than having it include the pedestrian phase without someone pressing a button. At least it’s much worse for pedestrians. This is getting back to what I mean when I say that I think your proposed system would be a lot worse to walk around in. Not sure how widely pedestrian detection cameras are used, where I’ve seen them used for bicycles you have to stop in a specific spot and wait there. I’d much prefer to be able to step back from the busy street. If they pickup anyone near the intersection or anyone who walked past it that would be like yielding to people who haven’t stepped into the crosswalk yet. How do you know they actually want to cross? People have had a hard time getting their bikes detected at inductive loops. Even with cameras it’s less obvious that you’ll get picked up than a car waiting at a light. Here’s a handy little solution to that. You need the capacity of two lanes in each direction given traffic levels. Except Francis lewis I don’t think you can fit a two lane roundabout at any of the arterial intersections you mentioned. And there you might need to take some of a field or two, or at least move the road closer to where people are playing/watching people play and cut down trees that help increase the perceptual distance from the road.
. Most of the pedestrian-heavy areas in NYC also happen to be along major auto routes. And that’s why I think the road design you advocate that doesn’t take into account pedestrian needs is poorly suited to the built environment we have in much of NYC. Union Turnpike seems to be mostly people coming from points further east passing through. How can you tell if a car turned onto union a quarter mile ago or five miles ago? And by the way, at peak hour you might have ~1300-1700 vehicles each way on union, something less than a thousand each way on the NS arterials. With heavy pedestrian traffic during rush hour – with the delay from drivers yielding to pedestrians – can you accommodate that many cars with a two lane roundabout? Perhaps we should just limit it to buses, local deliveries, bikes, and emergency vehicles. Waiving away the transportation provided by the existing road to people in cars…it makes more sense in areas of the city where less travel is by cars. In case you didn’t know the highways are pretty packed. There isn’t capacity for another 1300-1700 cars each way. You seem to oscillate between on the one hand saying get rid of the road as a place for cars in order to better serve locals/cyclists/transit riders, and on the other hand make it a better transportation corridor for cars, forgetting about the negative impact that would have on people who live, work, and play near it. Why is it so bad to compromise and imperfectly serve different classes of users? Within that framework you can still shift away from the overemphasis on motorists that’s usually present. Small incremental improvements can offer a lot to people who interact with a street outside of a car, even if isn’t the revolution you’re looking for. You could have the beg buttons coordinated to light cycles during peak times only. Off-peak you have them respond right away. Best of both worlds. During the day a pedestrian isn’t waiting any longer than they would be with regular phased signals. Late night so few people are crossing chances of the lights getting poorly coordinated is very small (I’ve seen this myself in action on NY25 which has sensors late nights). You seem to oscillate between on the one hand saying get rid of the road as a place for cars in order to better serve locals/cyclists/transit riders, and on the other hand make it a better transportation corridor for cars, forgetting about the negative impact that would have on people who live, work, and play near it. Why is it so bad to compromise and imperfectly serve different classes of users? I’m not sure those things are necessarily contradictory. As much as I hate to admit it, a road which is really great as a car sewer, meaning cars can go fast and rarely stop, is probably also great as a bike route, provided you offer bikes physical protection from speeding cars. So an unfortunate byproduct of doing things to encourage cycling will probably also result in more people driving unless you take active steps to discourage private car use. Discouraging car use also benefits bus riders, not just cyclists. As for compromise, ever consider that it might make some sense to prioritize different users depending upon the time of day? That’s sort of what I was thinking with my original idea of flashing yellow late nights and requiring pedestrians to yield when crossing. During the day you try to make things as pleasant as possible for pedestrians, at least in areas with heavy pedestrian traffic, even if it comes at the expense of motorists or cyclists. Once you get past maybe 8 or 9 PM you default to prioritizing motorists and cyclists given that they are the majority uses late nights. Seriously, I walk at night more than anyone here probably and more often than not I hardly see anyone else. When I ride I can go 25 miles without seeing a single person crossing the street in front of me. So why do things late nights for the benefit of mostly nonexistent pedestrians when it’s seriously detrimental to everyone else, including bus riders who have their bus sit at light after light while the driver stares at empty space? I even want to say my scheme is sometimes better for pedestrians. Consider that you’ll get vehicles hitting red lights while a pedestrian is waiting to cross parallel to them. Now consider that these vehicles may turn just as they get the green light, at the same time the pedestrian gets a walk signal. Wham, you just created an unnecessary conflict. Had those cars been able to stop, then make their turns, they might have been long gone before the pedestrian crosses. Red lights cause traffic to platoon. That’s bad for crossing pedestrians. It’s even bad for drivers. If those vehicles didn’t platoon, they’re not in close enough proximity to interact.